The National Archaeological Museum is planning a major exhibit for January on the great eruption of Vesuvius in 79 a.d. that destroyed Pompeii. Unexpectedly, they will have something new for the exhibit --the skeletal remains, uncovered the other day, of a slave. Archaeologists from the Japan Institute of Paleological Studies in Kyoto were working in the area of the presumed location of an ancient gate that led out from the city of Pompeii in the direction of Capua. The exact location is uncertain and has been the object of archaeological speculation for some time. In the course of digging around, the team came across the remains of a male skeleton with a metal ring on the leg, showing where he had been chained at the calf. It was a common Roman punishment to keep unruly slaves chained at night so they couldn't flee. The skull shows evidence of having been crushed. Presumably, then, he was not suffocated by noxious fumes or overwhelmed by the flow of volcanic debris; he was probably struck by a heavier projectile thrown up by the eruption. The eruption occurred just after dawn. Still chained in place, he couldn't run. Courage is a function of choice, and, certainly, the soldier so described was courageous -- heroically so. Our recently-found slave, of course, had no choice. Yet, there is no way to know how he behaved at the end, even chained as he was. "Unruliness" --especially in a slave-- is not necessarily a defect of character. There was a second skeleton --that of a woman-- found close by. Who knows if or how he might have tried to shelter her? Or she him. There's quite a sight in the southeastern sky before and during dawn! The waning crescent moon is closely paired with the brilliant "morning star," Venus, while faint Mars joins in to make it a triplet. The blue-white star Regulus is a little to their upper right. Arcturus is far off to their upper left. The best views will be an hour or more before sunrise. There was also going to be "earthshine," also known,poetically, as "ashen light"—when, close to the new moon, the reflected light of Earth is reflected onto the moon, enabling the whole lunar disk, even the part normally dark, to become visible and you see "the old moon in the new moon's arms" (that's pretty poetic for a Facts on File Dictionary of Astronomy!). Anyway, it was cloudy and I missed the whole show. Most of the time, however, I have quite a view to the southeast—the whole Sorrentine peninsula is a silhouette. 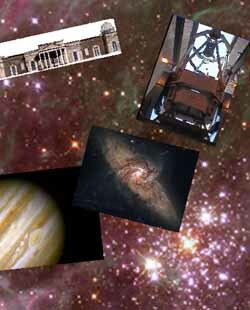 I often think that if I could live 5,000 years—10,000, max—in my house and watch the yearly procession of the sun as it moves from left to right, dawnstep by dawnstep, and then back—why, I could reinvent astronomy! I have part of it figured out already. In the summer, the sun rises behind Vesuvius. That makes sense. Vesuvius is a volcano. That gives the sun heat and causes summer. As the sun moves further out away from the volcano towards Sorrento, it gets cooler. Gotta check my newsletter. Maybe I'm missing something. "...Rossi takes the pass ... dribbles across midfield... long cross into Bernardi ... in the center ... 20 meters out.....past a defender... 15 meters out.... into the penalty area.... he loses it to Symien ... Symienkie... the Polish defender .... long boot back upfield .... headed back by Renaldo ... foul on Renaldo for pushing off on Stakov ... ridiculous... he didn't touch him! ...oh well... ball back in play at midfield..."
"...oh ... look at that.... that was close .....oops....c'mon!... hey, you know, I remember a game in 1998 where ... say, Mario, look at those fans over there... they seem to be setting fire to the stadium... well, back to the studio..."
You not only cannot almost see it; you can't even almost hear it! You are watching others watch the game! In such situations, throwing a chair through a TV screen is no longer the satisfying experience it once was. In a way, they have legitimized the "Neapolitan right of way" -- whoever is in front can do what he wants: turn, stop, go backwards. It's your job to avoid him. Richard -- a member of the generation that grew up on automatic transmissions-- is now concentrating on changing gears, a necessary skill on those few occasions in Naples traffic when you get up to 7 miles an hour. He made a few pounds of piping-hot, freshly-ground gears yesterday, I understand. He stalled 3 times. I am happy he is not learning how to fly. Lake Averno just up the coast from Naples near Pozzuoli is so bound up with our Western mythology and history that is difficult to think of it as the focus of a court battle. What is to become of this major arena of Greek mythology, also one of the training lakes for the Roman western fleet and, then, the entrance to the underworld for Dante and Virgil in The Divine Comedy? 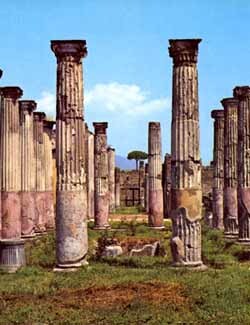 so-called Temple of Apollo. It is accessible by the footpath that runs the perimeter of the lake. The entire area is part of the Campi Flegrei --the Flegrean (Fiery) Fields. In the middle of the 1300s, the Angevin rulers of Naples gave the lake to the Monastery of Santa Chiara. Then, in 1798 the Bourbon ruler of Naples, Ferdinand IV, transferred that ownership to Juliano Pollio—a doctor—apparently as a reward for medical services. The lake remained in the Pollio family until 1991, when the legal machinery geared up to expropriate the property as a national treasure. The decision on just how expropriation should take place —in other words, who gets compensated for what?— has turned into a 10-year rigmarole. The final decision is, according to Neapolitan papers, now pending. I don't remember if, last year, there was one-way pedestrian traffic in the historic center of town near and on via San Gregorio Armeno. I do remember being pushed by a horde of people in a direction I didn't want to go, but I chalked that up to the staunch nonconformist in me—the different drummer, the road less travelled by-- all that. This year—with the Christmas push almost upon us-- the city is thinking of imposing just such a restriction. If you look at the map of the historic center of the city (click here), the area of concern is along via San Biagio dei Librai (known as "Spaccanapoli"—the street that "splits Naples") and the parallel street, via Tribunali. They are connected by a north-south street, via San Gregorio Armeno (unnamed on the map, but where numbers 27, 28, and 29 are located). 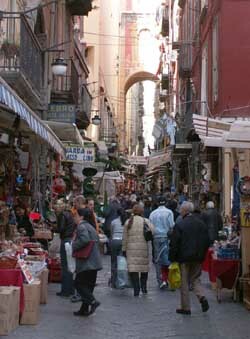 It is the "Christmas street," the site of the many shops and stalls that sell material for building the presepe, the manger display, the most typical of all Neapolitan Christmas customs. Within the next few days, it will start becoming virtually impossible to walk near via San Gregorio Armeno. There is an unbelievable mass of people, tourists as well as locals out trying to do some shopping. Thus, says the city, we need one-way walking on the lower road moving east, then left and up San Gregorio Armeno and then left again and one-way west and back out of the center. 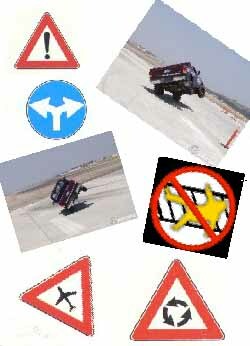 We should also have, says the city, traffic wardens enforcing this. This is almost certainly unenforceable, but I don't want to find out. 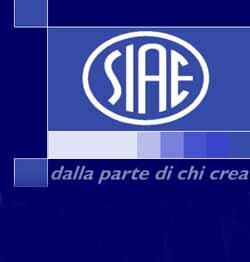 SIAE is the Italian acronym for Società italiania di autori e editori, the Italian Society of Authors and Editors. Although the Italian pronunciation of this combination of letters is amusingly close to "C.I.A. 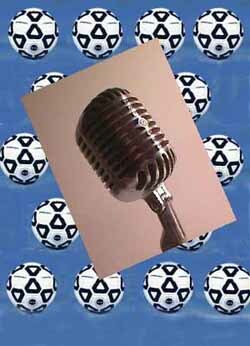 ", it is actually the organization that takes care of paying royalties on literature, songs and theatrical works. The Naples branch is very active; the offices are located on via San Tommaso d'Aquino, and the premises have always been a treasure trove of, among other items, all published Neapolitan theater over the last 80 years; that is, a library, of sorts, where the actual first copies of plays are stored—the versions that authors are required to file for copyright in order to be able to collect subsequent royalties. The so-called "Neapolitan Repertoire" for the last 80 years includes virtually all of the works of famous Neapolitan dialect playwrights such as Eduardo de Filippo, for example. 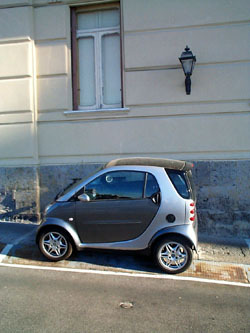 For many years, the entire collection was well taken care of by a local lawyer, Caro Capiola. His interest in making sure that authors got paid for their efforts was personal, in that he was married to an aspiring playwright. Capriloa was tireless in his efforts to protect the rights of those who wrote for the theater in Naples. This included dealing with crafty theater managers who would often try to get out of paying royalties to the author, because the author had just been paid as a performer in his or her own piece. (There were—and still are—a number of theatrical troupes in Naples—the de Filippo family, for one—where the authors perform in their own works.) That would be paying "twice for the same thing" said the impressarios. Not so, said Capiola—and he was right. In any event, all of this is now in the past tense, since the entire Neapolitan collection— some 8,000 original copies of various thearical works written for the theater in Naples—have been transferred to the main premises of SIAE in Rome. The works still exist, of course, but the originals are no longer in Naples. The local daily was a bit nostalgic about that. It's all in the name of efficiency and centralization, paradox notwithstanding. They are making a film about Eleonora Fonseca Pimentel, the tragic heroine of the short-lived Neapolitan Republic, which overthrew the Bourbon monarchy in 1799. The life of Eleonora has always attracted scholarly attention, including that of Benedetto Croce, who wrote a monograph about her in 1887. More recently, in 1999, as part of general 200th-anniversary observance of the failed Republic, Neapolitan composer and musicologist, Roberto de Simone, composed an oratorio, "Eleonora, " for the San Carlo Theater in Naples. More popular attention includes at least two novels: Cara Eleonora [Dear Eleonora], by Maria Antonietta Mocciocchi and Il resto di niente [The rest of nothing] by Enzio Striano (photo, left). The latter is the basis for the screenplay of the film currently under production in Naples as well as providing the title for the film, itself. 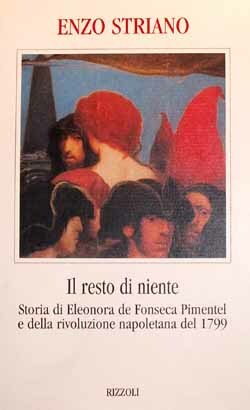 Il resto di niente is directed by a Neapolitan, Antonietta De Lillo, who bought the rights to the book in 1997, planning the film to coincide with the anniversary of the Republic. Various production difficulties have drawn that out, but the film should be ready for release by the middle of 2003. The cast is mostly Neapolitan and the filming, itself, is done locally, with much effort going into avoiding the visual anachronisms of Naples 2000 versus Naples 1800. Some of the shooting is along the coast at Licola, north of Naples, where "unspoiled" shots of the bay and the island of Ischia in the background are still possible. The scene of the execution of Eleonora, for example -- an event that really took place at Piazza Mercato near the Church of the Carmine -- is shot on the premises of the largely abandoned Hospice for the Poor, parts of which, today, look as they did in the early 1800s. The role of Eleonora is played by Portuguese actress Maria de Medeiros, perhaps some sort of tribute to the Portuguese descent of Eleonora, herself. The square also lends itself to modern sculpture of the kind that art critics call "installation art" and the rest of us rustic dullards call, "What in the world is that supposed to be?!" Generally speaking, installation art requires some—well,installation—something in the way of mounting, draping, hanging, digging or soldering. The displays, themselves, may include ("...but are not limited to...," as lawyers so craftily hedge) metal, wood, plastic, rubber, and assorted minerals, fabrics and liquids. And so, in past years, Piazza del Plebiscito has seen a gigantic mountain of salt dotted with pieces of machinery, apparently a metaphor of whatever it is that salt represents confronted with whatever it is that machinery represents—maybe life beset by technology. (Hmmmm, not such a "rustic dullard" now, huh?!) Then, one year, there was a large wooden replica of an ancient lighthouse that used to guard the harbor of Naples. Last year, there was a gigantic replica of the Angevin Fortress made entirely of soft-drink cans (photo). These exhibits go up in early December and are left in place for the Christmas holidays, at which time they are "uninstalled". Most of them are environmentally friendly enough to be dismantled easily or, in some case, vacuumed up. 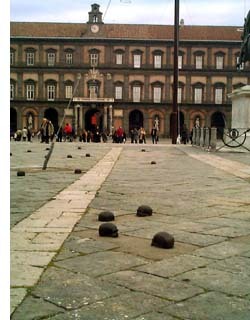 In 2003, they tore up the paving stones in the square. According to the paper, no one in the city administration recalls giving the go-ahead for any of this digging, but the latest piece of ephemeral sculpture was duly installed. It is a work by German sculptor and film maker, Rebecca Horn. Her history includes mechanical and body-extension sculpture as well as installation art on the premises of an insane asylum in Vienna. Austria. Her work is often controversial. The work consisted of a number of bronze skulls implanted in the pavement (photo). The work, thus, is Horn's tribute to—or variation on—the well-known Neapolitan "cult of death" (so-called by some) that centers on the vast collection of human skulls on the premises of the Fontanelle cemetery in Naples. The work is "site specific," a sub-genre of installation art, in that it makes sense only within the context of the place where it is exhibited—in this case, Naples. 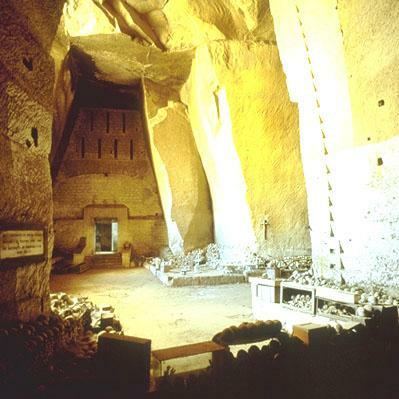 The Fontanelle cemetery is carved out of the tufaceous hillside in the Materdei section of Naples. The vast chambers on the premises served for centuries as a charnel house for paupers. At the end of the 19th century, Father Gaetano Barbati had the chaotically buried skeletal remains disinterred and catalogued. They then remained on the surface, stored in makeshift crypts, in boxes and on wooden racks. From that moment, a spontaneous cult of affection for, and devotion to, the remains of these unnamed dead developed in Naples. Defenders of the cult pointed out that they were paying respect to those who had had none in life, who had been too poor even to have a proper burial. Though the practice has largely disappeared, devotees used to pay visits to the skulls, clean them—"adopt" them, in a way, even giving the skulls back their "living" names (revealed to the caretakers in dreams). Yes, all that.